As you maybe heard in The Future of Things article, ARCA, an official GLXP team from Romania announced the upcoming launch of their Stabilo rocket. This declaration generated quite a hype on the net announcing the upcoming landing of the first contender of the GLXP on the Moon Surface. But what should we think about it? Is really ARCA going to land on the moon and win the prize … in few weeks? Well, don't worry, the answer is a crystal clear : NO ! So what is happening? In fact, if you read the GLXP website post you'll see that ARCA is really just launching its latest rocket, not the first GLXP launch but the last one of the original X PRIZE (the one that finished few year ago with the first private "space flight").Members of our team had the opportunity to meet and discuss with the ARCA representatives during the First GLXP Team Submit last May in Strasbourg (France). They explained then that the objective of the flight was to perform their first sub-orbital flight (so launch a rocket to few hundred kilometers of altitude) nothing like going to the moon. If you have seen some of their videos or concepts, you might have been a bit surprised by their, shall we say, "unconventional approach" but bare in mind that those guys are really taking it seriously and manufacturing/launching hardware … It should be a source of respect and motivation. Like them, our team hopes to soon start advance tests and why not be the first on the moon! To support our mission we will create a strong and independent brand image. To do this it will be important to highlight our differences from the other GLXP competitors. We will coordinate all our media activities to emphasize these aspects. We are proud to announce that we have a new partner for the Communications Subsystem of our GLXP Lander! 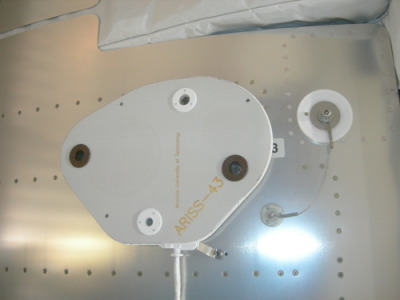 Wroclaw University of Technology's Institute of Telecommunications, Teleinformatics and Acoustics has extensive experience developing aerospace communications equipment including the Amateur Radio for the ISS (ARISS) antenna shown here mounted to the Columbus Module of the International Space Station. Any GLXP business plan we can imagine will be fundamentally based around the team's website. Luckily our team includes many people with diverse backgrounds. In addition to the obvious space engineering & science types, we also have people experienced in web design, media, graphics and art. We plan to implement our web presence with an incremental approach. As a first stage, during 2008 we used a Tumblr site to establish our initial web presence under the temporary name Thestor Cargo. Later we moved to this Blogger platform, which gives more features and has some very useful options for customization of the layout. In the future we will move to a more comprehensive tool such as Word Press for a fully featured website. 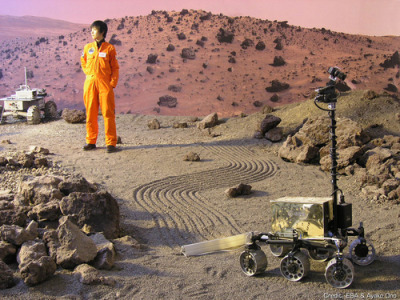 Since 1996 Ayako Ono has been exploring humanity's frontiers in the cosmos and imagination with her space art. The role of art is to stimulate the senses and imagination, broaden perceptions, and explore new perspectives. Sometime soon future generations will live far from the earth's surface. The resulting changes to the living environment will necessarily affect a radical transformation in common values. Space Art will help us prepare for the creation of these new values, and help answer the fundamental question of how human beings will evolve with these new values. In tackling this complex proposition, we will explore and invent new notions of beauty in cosmic space, through the interaction between various values systems.